You know, like the now well established 'Orctober'? 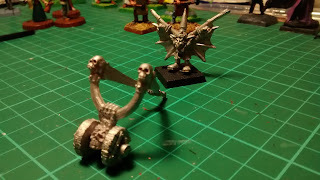 Or the very successful 'Deadcember' theme on the Oldhammer Community page (my contribution to Deadcember can be viewed here, I missed 'Vermember' 2015 sadly, but have some old school plastic skaven lined up and waiting for this year), or my less successful Middlehammer entry to 'Slannuary' of 5th Edition Saurus warriors (not too much of a stretch that one, but not quite Oldhammer enough)? Anyway, this month's Middlehammer painting theme was right up my alley - April Fools! I have been really enjoying painting fantasy non-combatants recently, and there is plenty one might choose in that vein, but that would really be more in keeping with Oldhammer than Middlehammer I feel (only my opinon - not looking to start that argument here!). No, for something that really said 'MH' it could olnly be the drug crazed lunacy of the Goblin Doom Diver! Here he is, the loveable little nut job. 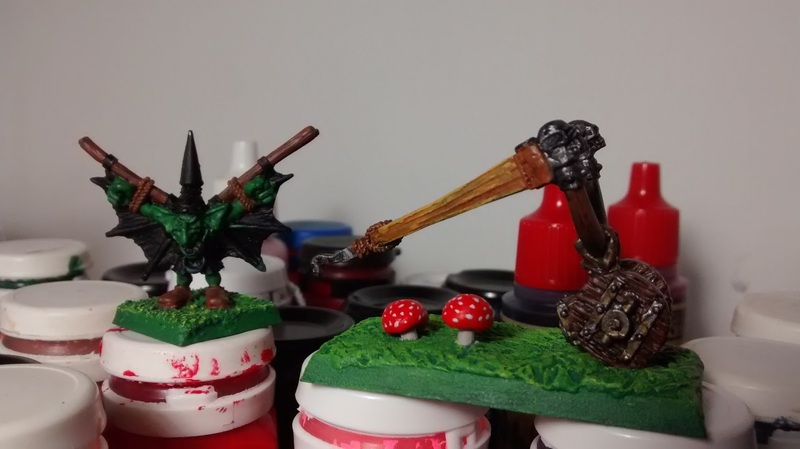 These are iconic to me of WHFB 4th edition Goblins, plus I'd recently purchased one for my growing greenskin horde which is being used in our WHFB4 campaign Crisis in Caledor (look out for new Battle Report soon, with greatly improved pictures and scenery), and I like to use the monthly themes to spur me to get things painted that are either directly related to current projects, or stand a very high chance of actually being used in a game in the near future where possible. 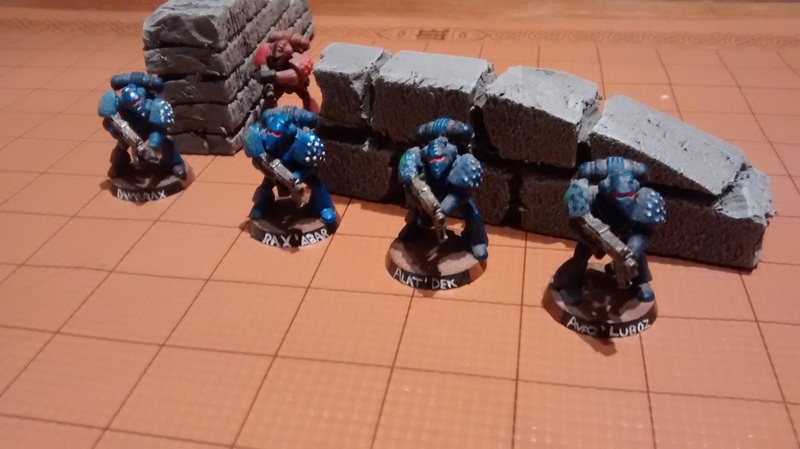 I also wanted to use this as an opportunity to work on my basing, which is one of my Hobby Resolutions for 2016, so in keeping with the background of the unit I decided to include some tiny putty mushrooms. It was only the second time I had ever bothered to do this for a base, the first being approx 20 years ago for Orion King of the Woods, who at the time was the most ambitious and successful paint job I'd ever completed. 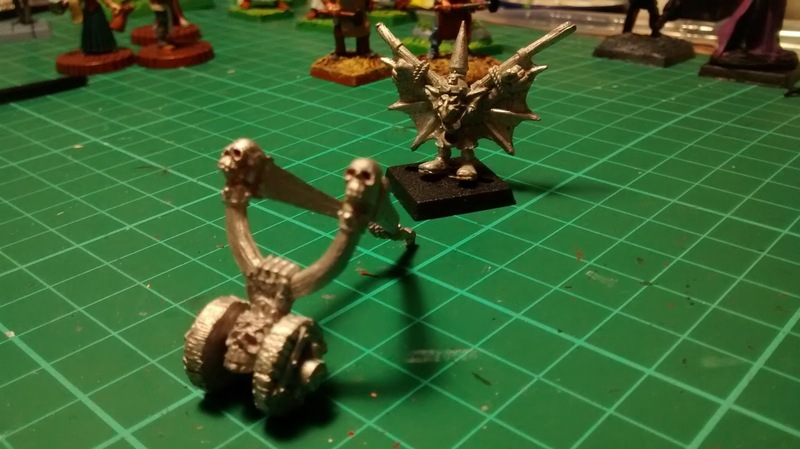 I now really regret not swapping the base for the goblin with one facing forward, but can't be bothered to go back and change it as I'm keen to keep moving on with other projects. Here are the two pieces with half their base coats on, and the bases worked up. I actually studied some pictures of Fly Agaric mushrooms (Amantia Muscaria the classic red and white toadstools) and noted that the white dots are far from symetrical and certanly not rounded in shape, they are like little irregular flakes in fact, so I tried to capture that but am now worried it looks too much like poor brushmanship. After catching myself obsessing about the accuracy of markings on a tiny putty mushroom less than a centimetre in diameter, I first realised how far I had come in my hobbying since deciding to get back into it properly last year, and then thankfully got over myself and moved on with the painting of the actual models. A view of the two pieces in progress. Note the naturalistic markings on the Toadstools. NOTE THEM DAMN YOU! Here you can see the attempts at different finishes on the metal work. The workings of the wheel are deliberatley more grimey whcih I think works. Not sure about the bronze hand in the end as it possible fades into the brown a bit too much. I decided early on that I wanted the catapult to use fairly muted and realistic colours, so went for a controlled pallette of browns and dark metallics. For example, I used bubonic brown with a flesh wash for the 'elastic' as I imagine this to be made from some monstrous body byproduct, the alchemically treated and stretched pizzle of a manticore perhaps? I used Boltgun metal over black for most of the metal, using more flesh wash (slightly glossier than brown ink) to create a greasy, rusty run off sort of look around the axle and outer wheel fixings, while I tried to create some variation by using a Tin Bitz and Shining Gold to make the hand gripping the arms of the catapult appear a dull bronze, which also ties in to other elements of my existing forces. There IS quite a lot of RED in my greenskin horde, but this is balanced by grubby, muddy tones in many places overall to make feature colours stand out and to add realism. In this case it also serves to allow the Goblin whackjob to take centre stage with a more colourful look to fit the April Fools! theme. I'm pretty happy with the muted and realistic colour scheme on the catapult, although I might make some changes were I to do it again. Next time I'd probably go for a naturalistic look on all the skulls to break up the monotony of metal and wood. I wanted the goblin to really bring home the April Fools! theme so had always intended hm to be wearing some form of Jesters' motley. I decided on simple red and yellow quarters, the red to fit in with the rest of the army, and the dirty yellow being a nice counterpoint but still well within the Greenskin's preferred MH colour spectrum. Any rope and wood was given the same treatment of Snakebite Leather or Bestial Brown followed by dark brown/black ink across both pieces to help tie them in, the dark bronze and iron colours were also repeated on the goblin. The Goblin flesh was a very simple job but one I'm really happy with, Snot green base coat, orc flesh wash, Snot Green hightlights, then mixing in Badmoon Yellow to finish. Worm purple for the tongue, bleached bone for the teeth, and blood red eyes as always. I'm really happy with how the face turned out in particular. I wanted to keep the wings dark so the jester's costume would stand out, but not brown or black, so I opted to mix my own very dark blue-purple-black, which was then washed down with blue ink. I should have done more work to highlight this with some of the Liche Purple I used in the mix, but again I didn't want to take away from the jester's garb so kept it muted. I think this view shows it is lacking a few highlights on the metal and the wings, but I'm fairly happy with the execution of the colour scheme I had planned. The two finished elements together. I'm pretty chuffed overall with this piece, and I certainly enjoyed it immensely. I also doubt I'd have even started it let alone finished it during April without idea being spurred by the Middlehammer painting theme. 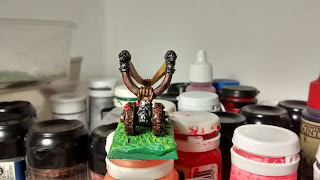 This fool is now ready to make an appearance in our WHFB4 campaign alot earlier than otherwise, so it shows what good motivation a Monthly painting theme can provide! 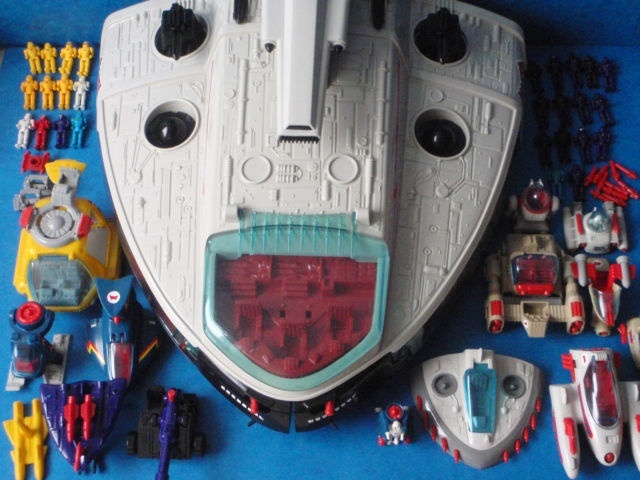 Although sadly I've not seen too many others posting their own contributions, that is part of why more themes would be really good to encourage more community content from the Middlehammerers, so I hope you've enjoyed this post and that we see more themes and more contributions in the future! 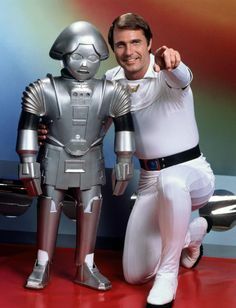 No this is not a mispronounced exclamation of support for the Robot from Buck Rogers in the 25th Century, although if you want I could totally do a blog post on that!? No, oh OK... I'll carry on with this post about the Oldhammer Community's Beakie Week then. 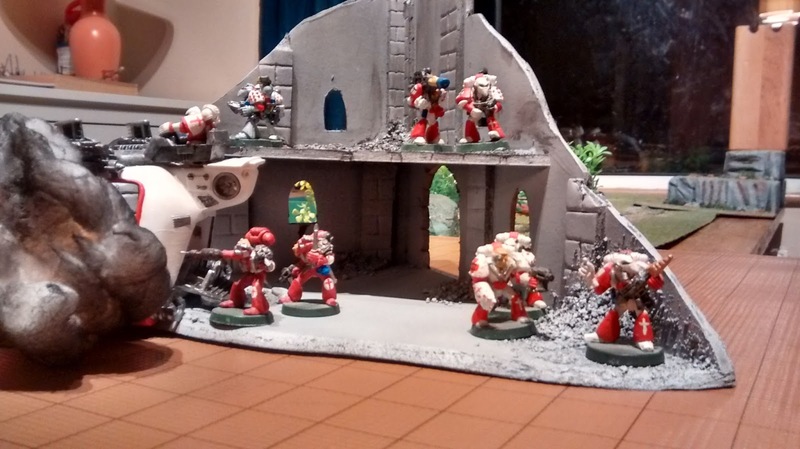 For those who didn't know this last week saw the 30th Anniversary of the launch of the iconic Space Marines from GW. 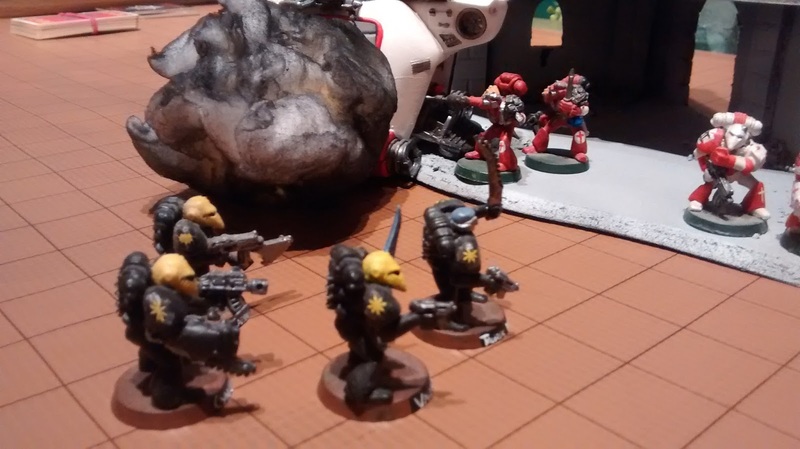 Now, love them or loathe them for what they came to represent in terms of the Grimdark takeover and the narrowing of the range of GW games and models, their success and appeal is undeniable, and for me, like many, the Mark VI or 'Beakie' Power Armoured marines of the original releases are the still the best. 'Beakie Week' is a celebration of their 30th Anniversary and all things Beakie! This is my contribution. The painting is strictly table top standard only, but here are some of my MkVI Fire Angels (veterans of the Badab War, first seen in Rt Compendium). 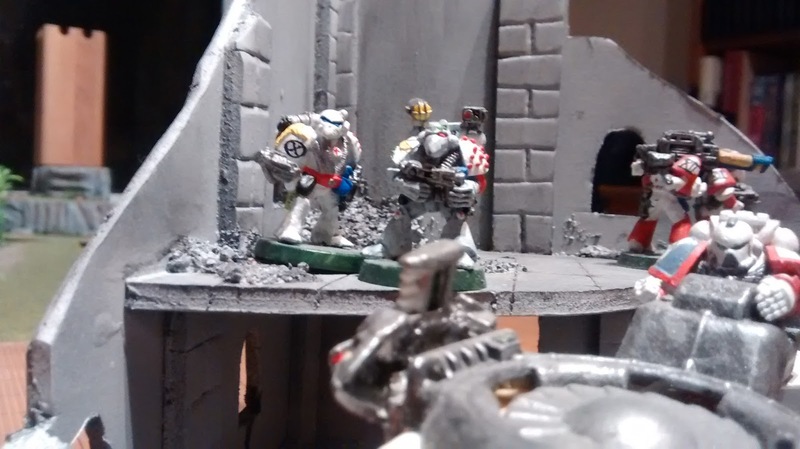 Ruins by my mate Big Dave, the Scenery Savant. 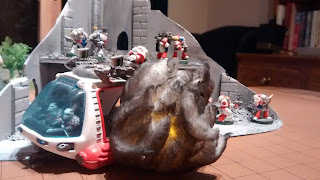 Their 'Manta' class Speeder Gunship has been shot down by enemy fire! Techmarines are trying to affect repairs, while Apothecaries from the 1st and 10th companies scan the surrounding area using auspex and photon search light. With typical discipline and tactical acumen a combat squad of veterans prepares to defend the crash site - but what brought them down? 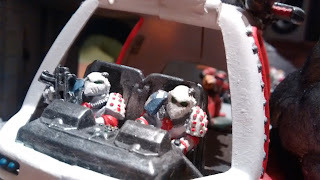 The pilots are from the Fire Angels 8th company Test Pilot corps. The models are the crew from the RT Land Speeder. Let's not talk about what happened to their legs to fit them into that cockpit, but please don't ask them to stand up. 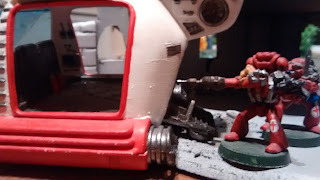 The techmarine in this pic is a conversion from RTB01 legs and the body of the techmarine jet bike rider. 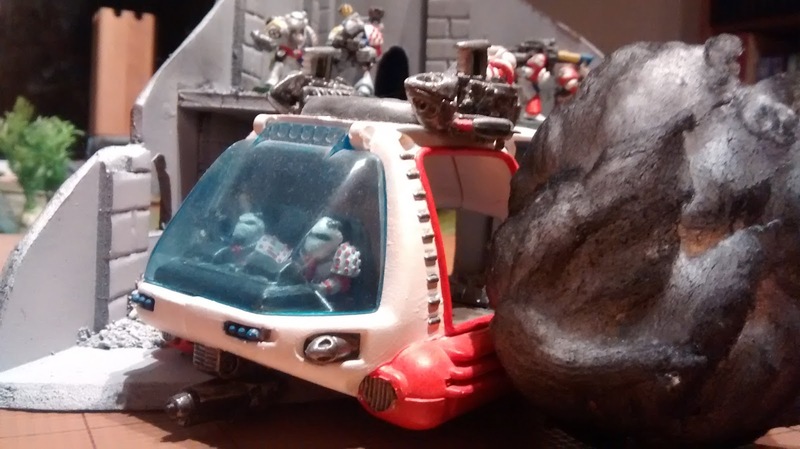 The Giant drill is from the Orc Battle Wagon set I think? Veteran marines adopt defensive positions, covering the specialists at work. Traitor Marines spring their ambush, luckily the heavy weapons that downed the Manta are nowhere to be seen (because they are carried by Mk VII marines, who are keeping respectfully out of sight). 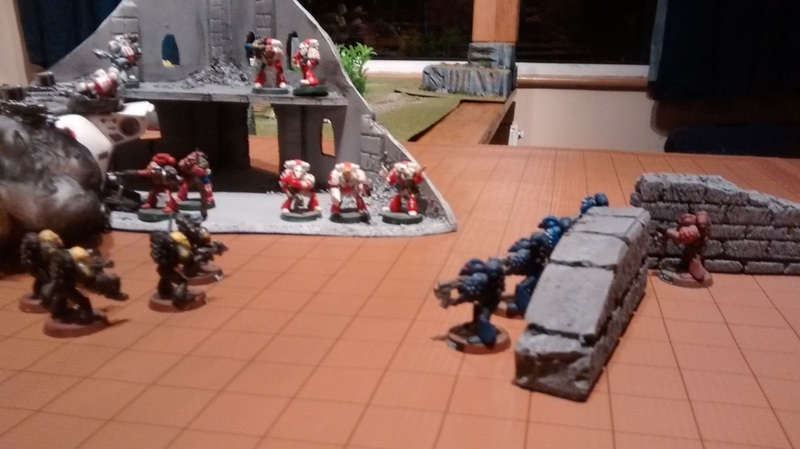 Alpha Legion marines move out from behind cover to engage the Fire Angels. The Word Bearer seems less keen, but shouts encouragement from the ruins. I painted up a number of small squads of traitor marines for use both as part of a larger Chaos Marine Army, and for GMs use as enemy 'crews' in our currently lapsed multi level 40K/Epic/Inquisimunda campaign 'Vortigan V'- many of which are rescue and repair jobs from other half finsihed and terrible paintjobs and conversions either from e-bay job lots, donations from friends over the years, or my own bits box. 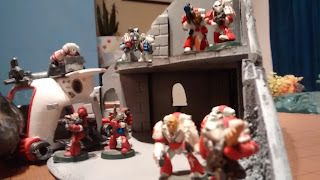 I've only shown the Mk VI ones here but there are some Mk VII examples too, traitor Blood Angels and Successor chapter marines who have been tempted away from the light of the Emperor by the perniious scheming of the Word Bearer you can see skulking in the background in the pictures. We also have some Alpha Legion tactical marines, and a close combat squad of Black Legion (who sometimes double as Traitor Flesh Tearers). These were converted with a nod towards those early Mk VI conversions from the modelling section of the Rogue Trader book. The Fire Angels' 'Manta' class Speeder-Gunship, as some of you will no doubt recognise, is a conversion of an old 1980s plastic toy from the Manta Force range. Manta Force, in all it's 80s glory! This is what it looked like all neatly packed away, which must have been a very rare sight indeed. I can see why someone's mum marked the occassion with a photo. A conversation with a fellow Oldhammerer on fb led me down memory lane with Manta Force and reminded me of previous plans to gather more examples from the range to convert for use in RT/40K. Hopefully my ebay bidding does not get out of control! Hi all, and welcome to episode two of Crisis in Caledor! That's the name for the WHFB4 campaign I'm playing with AVP Shaun. 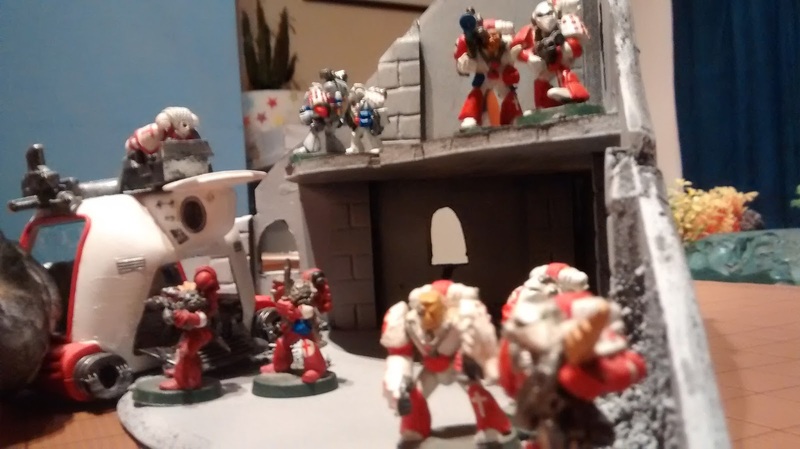 This game was actually played over a month ago, but a combination of yet another visit by Father Nurgle to our house, and the need to concentrate on some real life stuff for a bit has meant a long delay in publishing this. We are actually due to play the follow up scenario to this game next week, so I thought I'd better get this one sorted out. 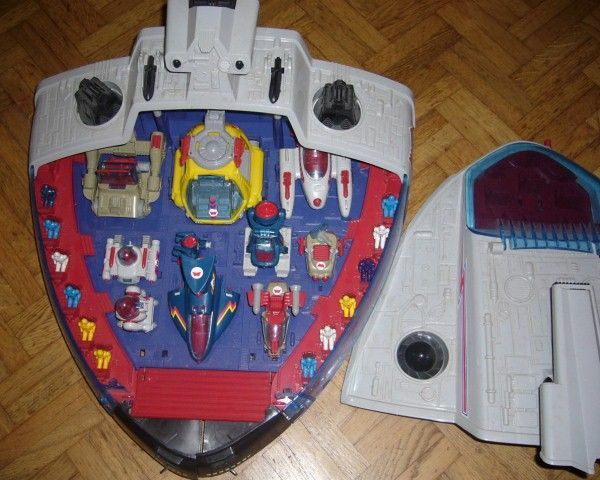 This game ended up being a massive rush as we were playing after work and had to fit it in around my kids bed time, so apologies that we only got photos of the set up and not any of the subsequent action. 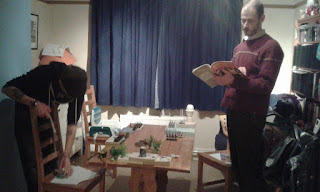 Further apologies for the poor quality photos, which were kindly provided by my wife on her mobile phone, while we were still trying to get ourselves ready to start. That's me on the right, consulting the WHFB4 rule book. AVP Shaun is sagely considering his battle plans. The proud High Elves of Caledor find the forces of evil on their very doorstep with no explanation! So far it has been a rag tag horde of Orcs and Goblins, but something more sinister must be driving this sudden and inexplicable invasion of the Elves sacred homelands. As they watch the few remaining orcs and goblins flee back down to the craggy beaches and sea caves from whence they must have come, the Elves take their opportunity to deploy the tower's deadly Repeater Bolt Thrower, and saddle the small number of horses normally used for mounted patrols. Before they'd even finished polishing the guilded wings of the ornate warmachine with their military issue polishing doillies, they could already see the second wave of wretched greenskins climbing to the top of the hills in front of the watch tower. High Elf captain and noted Spearman Champion, Magnus Paulus turned to look up at his younger cousin as he swung himself into the saddle of his barded warhorse, gracing his older relative and commanding officer with a cocksure smile as his long blond hair blowing in the breeze. No wait! The breeze was in the other direction, and was too weak to be doing that to Mayal Flashearts' hair! "Flash, have you paid that stupid sorceress to enchant your hair again!?" His cousin at least had the decency to look abashed. "Confound it you fool, I've warned you what might happen if that hair gets in your eyes at a crucial moment in battle all because it has a life of its own! And besides, you know that enchantment gives people terrible split ends!" "Enough." Magnus Paulus held up a hand to stop what was already a ridiculous conversation. "You know what must be done? Ride for the beacon, light the signal fire. Do not look back. Keep your eyes out for trouble, Thanas and the others should have lit the fire at the first sign of trouble so something must have got to them first. I doubt the beacon is unguarded." "Relax cousin" Mayal soothed "I know what I'm doing, and those Orcs we just sent packing were no match for our skill at arms. I can't see these goblins being made of any sterner stuff!" He set his spurs to his mount and led his small unit of riders off to position themseleves for a straigh run to the beacon. Not a moment too soon as the massed ranks of Goblins let out a howl and began advancing on the tower. Magnus Paulus gripped his spear tightly. They were badly out numbered. He hoped Flasheart's confidence in Elven military skill would prove right. 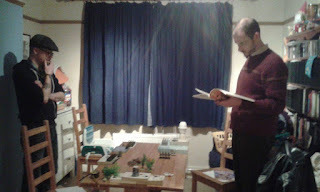 Having been set up for a while now, I'm still checking rules. AVP Shaun is losing the will to live. The scenario was for a battle of up to 6 turns, with additional victory conditions. If the Elves could get to the beacon and be in control of the area by the end of the game then they would get 5 VPs. If they could defend the tower and be in control of the area at the end of the game they would gain 3 VPs. 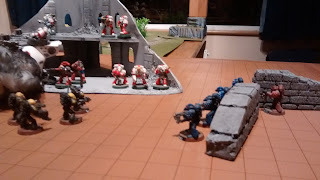 If the Goblins could overwhelm the defenders and take control of the tower area by the end of the game they would get 5 VPs/ If they could keep the Elves away from teh beacon nad control that area by the end of the game they would get 3 VPs. 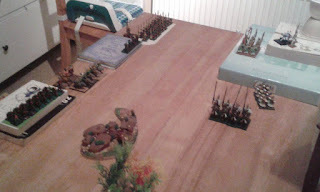 Deployment rules meant that the greenskins could deploy anywhere along the length of their side of the board, but the Elves had a 12" by 12" square in the top corner of the board in which to set up. Turn One: The High Elves start things off and Magnus Paulus must have immediately face palmed as he saw his young cousin Mayal Flasheart wheel his Silverhelm Cavalry round to redeploy in the center of the battle field, where they obviously thought they were protected or at least obscured by the rocks and trees, ready to charge into the goblin lines. Mayal obvioulsly though the masse ranks of goblins would need some thinning out first if there was to be any hope of the Elves not being massacred. The other elves must have been distracted by this, knowing the plan as they did, as all but one of the archers missed and the one tha tdid hit rolled a one to wound, and altough the Repeater Bolt thrower took down three front rank goblin spearmen, the bolts failed to penetrate the second rank and the goblin advance continued unhindered. Meanwhile, a pack of lightly armoured but very fast moving goblin wolf riders had been sizing up their chances of making a sucesfull charge through the trees against the Silverhelms. We'd discussed the terrain and what effects it would have on movement, and by the letter of the law the charge would probably not have been allowed due to the formation clipping the edges of terrain on both sides as they passed through, but they were within range and the highly manouvreable wolves in my mind would not have had a problem bounding over trees and rocks. So we allowed it. Then we determined that it would indeed be a flank attack.... could I change my mind about those terrain rules? The Silverhelms pass their psychology test for the flank attack and hold firm in the subsequent combat, felling one wolf rider. Meanwhile the other Goblin wolf riders fire their bows with more hope than belief, but score two 6s to hit at long range and manage to kill an Elven archer, although the small unit of Orc Arrer boys the gibs have dragged along sullenly refuse to hit anything useful. The goblin Big Boss on his monstrous spider, captured in the sea caves and harnessed with salt crusted remains of ships rigging, skulks forward firing his bow at the Elven defenders but his arrow falls short. Never the less the greenskin advance lumbers on with the two Ogres moving up behind the main unit of goblin spearmen as they approach the Watch tower on its hill. 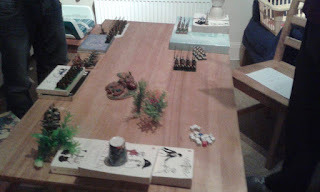 The greenskin horde lined up in classic fashion with missile tropps on the high ground and infantry, cavalry and shock troops positioned for various marches and charges. 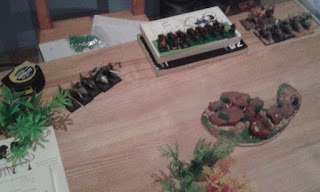 The High Elves however set up with their primary mission in mind, with their cavalry facing away from the enemy, towards the beacon at the other end of the table. Turn Two: The confidence of the elves is clearly shaken. The archers fail to hit a single thing and are rapidly coming to regret their deployment below the hill as they are now exposed. The plan had been for the archers to advance down field to occupy the center, hopefully supporting both the defneders of the tower and the riders trying for the beacon, but with the Silverhelms already engaged in combat this was no longer possible. The bolt thrower again proved its worth mauling the advancing unit of goblin archers on wolves and sending the survivors fleeing back 8". In the centre Flasheart leads his cavalry to victory over the other goblin wolf riders, although losing one of their number in the process, the Silverhelms pursue and run down the fleeing greenskins and find themselves within 6" of the beacon! The elven sense of victory is short lived however, as before they can take advantage of the vacated cover in the centre of the field the archers are charged by marauding Ogres. In a brief echo of their valour in the previous battle the archers not only pass their fear test, and withstand the Ogres feeble attacks, but they manage to score a number of hits in return. Sadly, they needed 6s to wound and none were forthcoming. Meanwhile the Goblin spearmen advanced unmolested to the foot of the hill, and the Goblin Big Boss moved up in support on his Monstrous Spider. The Orc Arrer boys again failed to hit anything, with one being seen to be sracthing his arse with one of his arrows when he should have been shooting at the enemy. We weren't even using the animosity rules this time! Alas for the High Elves the goblin archers mobbed on the hill overlooking the bottom of the battle field peppered the Silverhelms flank with 7 out of 16 hitting, causing 4 wounds and one High Elf not making his save. The already small unit of High Elf cavalry was suddenly looking very underpowered. Here you can see the whole deployment. Note the massed greenskins can occupy the whole length of their side of the table, where as the Elves are contained in the top corner. The beacon sits atop a hill at the bottom of the table. Turn Three: In a crucial moment in the battle Mayal Flasheart's youth and inexperience cost him his life and the Elves the battle. Rather than manouvring back around the otherside of the beacon, out of bow range but within range to claim the VPs, he wheeled his mount and exorted his remaining companion to charge up hill at the unit of goblin archers. His plan may have been to force the unit to break and flee, hopefully spreading panic accross the greenskins back line and potentially saving his embattled kinsmen at the tower. Sadly his charge was not at quite enough of an angle to hit the goblins flank and the two Silverhelms crashed headlong into the mass of goblin archers, who had stood firm and shot their bows at point blank range causing yet another wound to the Elven cavalry. Showing just how good their basic troops can be (though bloody expensive and therefore always outnumbered!) the High Elf archers score a number of hits against the Ogres and this time manage to wound one of the brutes twice. Sadly on their turn the Ogres would squash one of the elves into goo with their clubs in revenge. 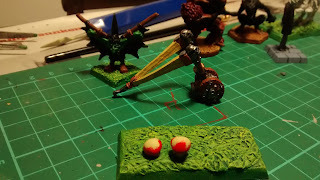 The small unit of archers was already in dire trouble when they were charged in the flank by the Goblin Big Boss on his Monstrous Spider, although they again pass all their psychology tests and stay in the fight. The goblin wolf riders with bows who had been heading back to the beach finally pull themselves together enough to fire a volley of arrows, though tehy end up falling short. The Orc arrer boys miraculously score two hits against the Elen Spearmen on the opposite hill, though rumour after the battle was that these were two very wayward shots from the Orc's game of trying to hit the dead corpses that had been left from earlier in the battle, and were totally unintentional. The formidable force of the Big Boss and Spider killing four archers, plus the one squashed by the Ogres, breaks the few remaining archers and they are run off the field. Back at the watch tower the main unit of goblin spearmen had finally climbed the hill and had forced combat with the spearmen, scoring an impressive 5 wounds to the spearmen's 1. Out of character for the brave High Elves, the Spearmen broke and retreated back to the doors of the tower. Thankfully the goblins could only follow up 4" so fell short of running them down and butchering them on the doorstep of the watch tower. Magnus Paulus just manages to issue instructions to pull the bolt thrower inside and get it up on the roof before he has to slam and bar the door to the tower, trapping them all inside. A close up of the goblin forces set up in the middle of the battle line and challenging for control of the beacon. Meanwhile, in a gory and ignoble end to the battle, Mayal as the last remaining Silverhelm simply could not do enough against the overwhelming numbers of goblin archers who do more than enough to win the combat and make him turn and flee desperately back down the hill. Tragically his line of retreat ran him straight into impassable terrain and the goblins easily catch him, devouring him and his steed alive. So... In truth it was a whitewash and a well deserved victory for the greenskins. Some very poor tactical decision making/execution of manouvres on my part saw my plan fail pretty early on. However, the way the combats worked out with the Silverhelms not sticking to the plan, and the final failure of the break test by the elven spearmen seeing them run back into the tower made for a perfect narrative and set up for the next scenario, which I will bring to you (hopefully with much better pictures) in Episode 3 of Crisis in Caledor: - Siege of the Watch Tower!